And in my kitchen it will be seafood and eggs, and here is my recipe. In a pot add oil then sauté ginger and garlic until light brown. Add squid balls and stir fry for 2 minutes. Add chicken stock, carrots and corn, bring to a boil and simmer for 10 minutes. Add shrimps, fish and dissolved cornstarch, bring to a boil and simmer in low heat for 2 minutes. Pour beaten eggs while gently stirring the soup. Turn off the heat add sesame oil and spring onions then season with salt and freshly ground black pepper then serve while hot. Brilliant recipe – a great way to introduce more seafood into my diet. I want to try out this recipe Raymund, the eggs inside are simply gorgeous. I love egg drop soup. I have never even thought to make it myself. Your recipe looks great! Looking forward to trying it! We like egg drop soup, it seems easy enough to make, don’t know why we wait until we go out to have it. Will have to try to make it at home now. Your kitchen is a good place to be! 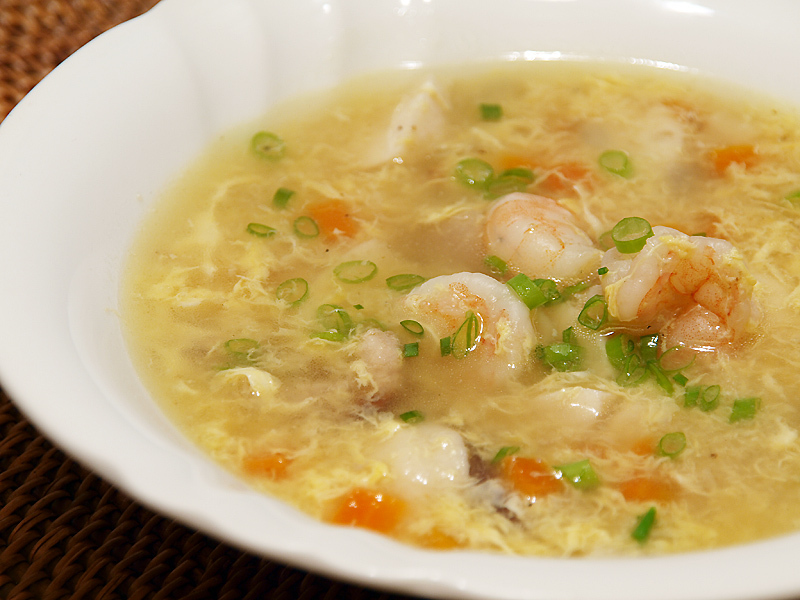 Great idea to add seafood to egg drop soup (which is already one of my favorite dishes). I’ll have to add this to my meal plan soon. I love egg drop soup! This certainly seems like an adventurous soup for me, but I might try making something similar with maybe only shrimp and tofu in it! I love soup… and this is one of my favorite soup… i will surely try this recipe! Your egg is perfect! So beautiful…and this soup looks like it is hard to capture with camera, but you really nailed it! I am a soup girl and I love thick egg-drop soup. Ang sarap ng egg-drop soup na to..ang daming sahog!